Invented and patented by Belson, this CHAR-WOOD® Campstove is adjustable to four different heights. It will burn wood or charcoal, has a self-contained anti-theft locking device, and a swivel mechanism which allows 360° rotation for wind draft control. To provide wheelchair accessibility, these park grills have a 5"Longer pedestal. 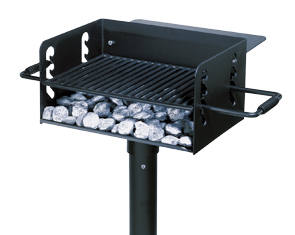 Firebox: 3/16" steel plate with integral slots to allow grate to be adjusted to four different heights. 10"High firebox walls provide a wind guard for the cooking area. Grate: 1/2" round steel bars welded on 1" centers. Handles: 5/8" round steel bars welded through the sides of the firebox to prevent grate removal. The handle is protected on each side with cool-spring wire hand grips. Pedestal: 3-1/2" O.D. steel tubing, 30" Long with special vandal-resistant locking nut and bolt. Pedestal is to be mounted in a concrete base. Finish: Non-toxic heat-resistant flat black enamel. 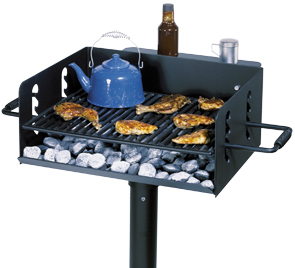 Optional Utility Shelf: 3/16" steel plate which fits on any CHAR-WOOD® grill. Sold separately.